The Isaac Touch is a 70,000 word, contemporary fantasy for Young Adults with two POVs, a biracial female MC, and clue-seeking, romantic adventure through five countries. Sixteen-year-old Isaac wears gloves, even in the sticky summer heat of Baltimore. 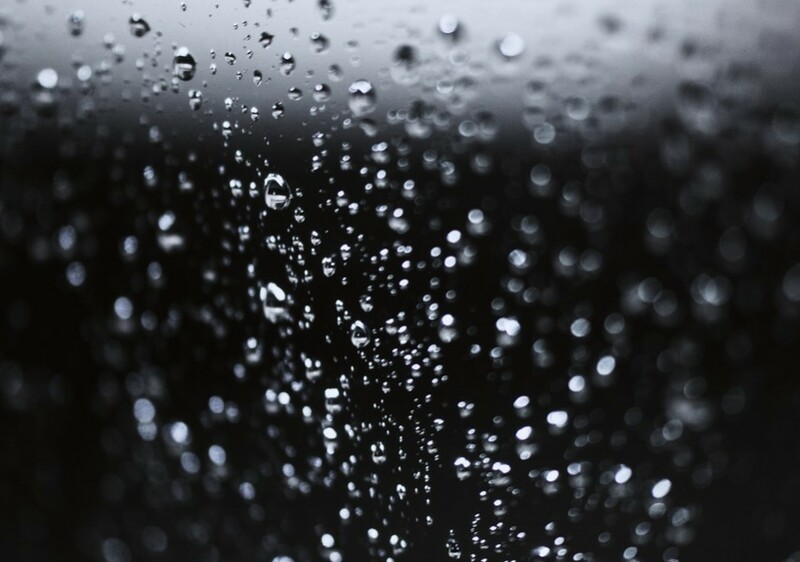 He hates and fears his Midas touch — it’s chemical, unpredictable, and potentially very dangerous. Desperate for a cure, he delves into biology, mineralogy, alchemy — anything that will help him control the gilding. And then Isaac meets Lee, a brilliant slacker with secrets of her own. Lee guides Isaac toward realizing that reality, myth, and science are melded together, along with power and desire. They begin to suspect there is a chemical formula hidden in history, a formula that may cure him. They decipher clues in ancient artifacts, medieval manuscripts, and even old fairy tales, clues that send them around the world. But Isaac and Lee are not alone in their quest. A shadowy sophisticate — twisted by greed and unlimited wealth — will stop at nothing to possess Isaac’s newly acquired knowledge. Isaac is terrified. Can he trust Lee and keep her safe? Can he trust himself not to touch her? 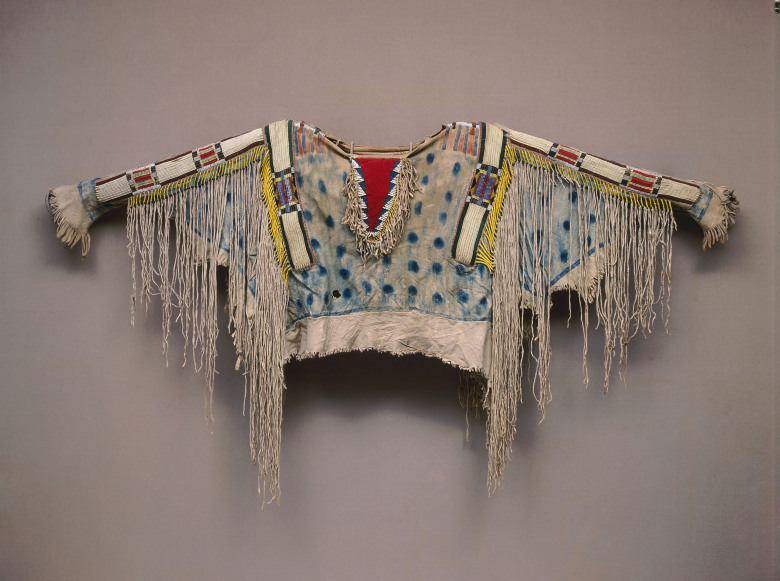 Sometimes I can’t believe I got my Ph.D.
I’m enthralled by museums, art, archives, and symbolic decoding. My art criticism for The Seattle Times and my job teaching art history at Cornish College of the Arts have bolstered my skills in conjuring mental imagery and communicating with different audiences, particularly of the new adult variety. I cut my teeth on fairytales. All through childhood, I devoured stories and forged some of my own. (Pictured above, my much-loved copy of the Grey Fairy Book). My own story fabrication dropped away for a while although I’ve been writing non-fiction for years. 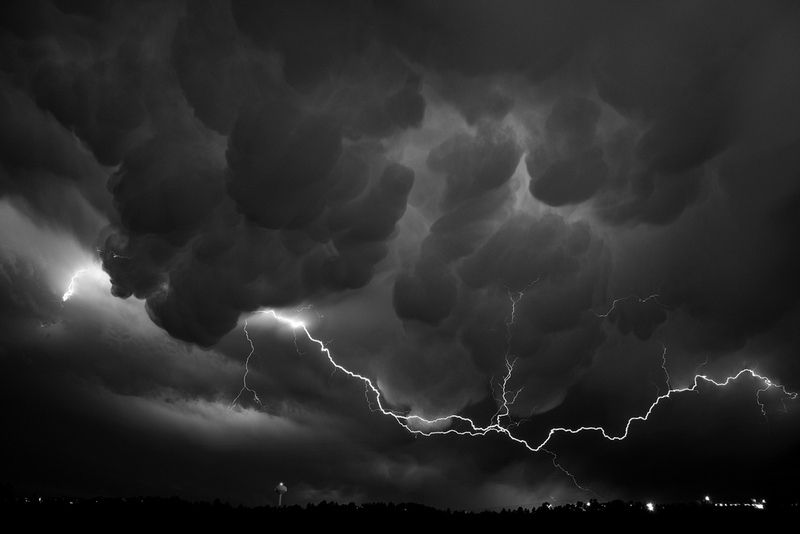 I returned to writing fiction unexpectedly and almost obsessively. One day, while struggling to finish my dissertation, an idea for a novel lodged itself in my brain and wouldn’t let go. I had to write it out of my system. And then I got another idea for another novel. And then a short story. And so it goes. The Handmaid’s Tale by Margaret Atwood showed me how fantasy could feel so real. A.S. Byatt and Umberto Eco helped me see how intellectual and creative pursuits could be interwoven. As for my writing style? I flatter myself by thinking my book is close to what Maggie Stiefvater might have come up with if she’d taken a crack at The Da Vinci Code. With, you know, more fantasy and less conspiracy. Have I mentioned that I love medieval manuscripts? Oh, and 19th century photographic equipment? And then there’s all that TV to watch – mysteries, period dramas, and sci-fi/fantasy shows: Firefly, The Walking Dead, Jessica Jones, Ripper Street, Pretty Little Liars, Twin Peaks, Downton Abbey. I’ll take it all, thank you very much. Last but absolutely not least: I’m all in for community-building! I can be found in various on-line lands. Maybe I’ll see you there? Confession #1: I am a part-time writer. I hate to admit it because it sounds like a downgrade. It took me so long to build up the confidence to call myself a writer in the first place and now I’m compelled to qualify that label? “Part-time writer” sounds like “Sunday painter.” A dilettante, a dabbler. But the reality is that I have a full-time job and a wonderful family and I have to squeeze my writing in around those commitments. Resolution: Let go of the guilt. Guilt that I’m not working hard enough to be a “real writer,” whatever that is. Guilt that I’m working too hard at something that doesn’t bring any money in. This year, I will try to swap the guilt for pride, or something like it. Being a part-time writer has constraints and challenges. Maybe, just maybe, I can give myself credit for taking on those challenges and doing something that is creative, liberating, and scary. Confession #2: I have become a feedback junkie. My desire to be a “real writer” has led to the inevitable plan to increase my social media presence. And, much to my own surprise, I’ve enjoyed it. I love (virtually) meeting writers, learning tips, taking photos, smiling over shared struggles and triumphs. The downside? I have become mildly addicted to clicking and scrolling and levelling up. Ooh, is my Twitter notification bell ringing? Do I have new followers on Instagram? Resolution: Re-commit to my writing schedule, a schedule that now includes a shiny slot for social media time. I’m a mom, dammit. I know how to limit screen time and offer carrots for tasks completed. I hereby resolve to reward myself with Twittertime only AFTER I have completed a solid chunk of writing. Confession #3: I want it. I want to be successful, to land a literary agent, to get my first novel published. This kind of honest ambition is hard for me to own. As a mother, I’ve adopted willing self-denial and a contented focus on my children. As a teacher, I’m also focused outward, on my students, on the content of each lesson. It’s different with writing. I’m putting my own creations out in the world, pieces of my imagination, refracted reflections of myself. To want success for myself feels egotistical and that makes me squirm. Resolution: Figure out what I really want. I already know that writing fiction stimulates and satisfies me. It’s ego-nurturing, not egotistical. I don’t get paid for it and I have spent countless hours working hard at it. So, perhaps what I really seek is validation that this crazy adventure is worthwhile. Worth my time and maybe even somebody else’s time. Somebody out there might choose to pick up my stories and come away with the same kind of exhilaration that I feel when writing them. That’s exciting. That’s worth wanting. Final thoughts: Here at the beginning of 2016, it’s easy to see potential. It’s harder to examine the realities of this part-time writing life (or #writerslife as we say on Twitter, ignoring the ironic error). This post is really a commitment to be candid about my writing journey, pitfalls and all. And to connect the pitfalls with bits of positive problem-solving. And so, I’m ready (sort of) for a new year filled with honesty and resolve. Joy to the Worlds Book Tour! 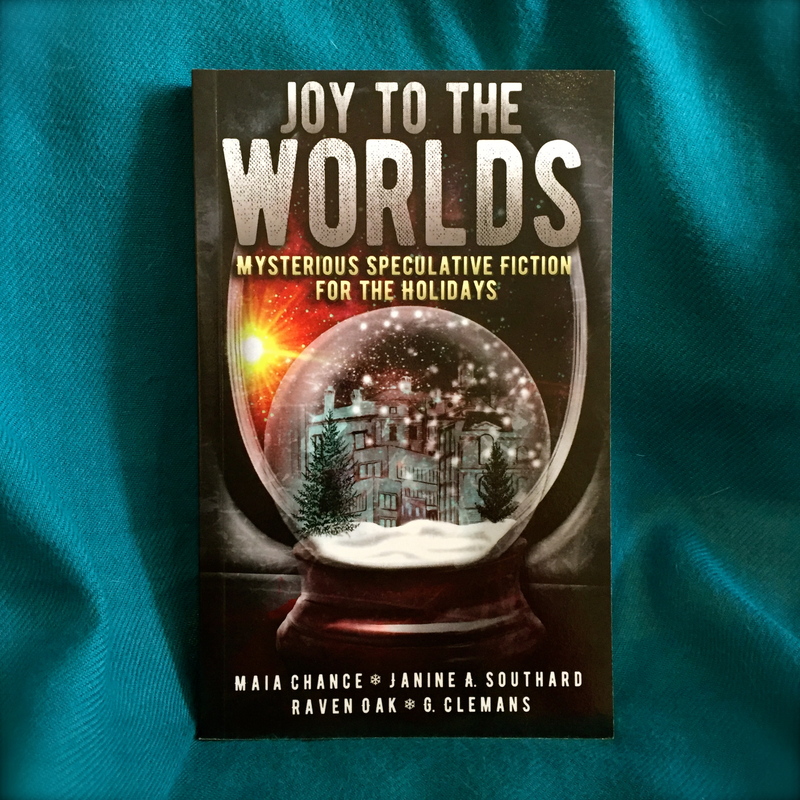 Joy to the Worlds: Mysterious Speculative Fiction for the Holidays has been released and I’m thrilled to say that it’s having a great ride (great reviews, great on-line sales, just great stuff all around). Please celebrate with all four authors (including yours truly) by joining us for one (or more) of these fun events. There will be prizes and/or treats at every single one. I’d love to see you there! DEC. 5—Virtual Book Tour Event streaming live on Google+ and YouTube. Join us for a short reading and Q&A. We’ll be giving away a free autographed copy as well. (Link coming soon.) 5:30-6:30 PM CST. DEC. 6—UW Bookstore Event in Bellevue, WA. Join us for a mini-mystery hunt (with prizes), seasonal treats, Q&A, and book signing. 3-4 PM. Further details here. DEC. 11—Barnes & Noble Event in Beaverton, OR. Join us for a reading, Q&A, and signing. 7-8 PM. Further details here. DEC. 12—Seattle Mystery Books in Seattle, WA. 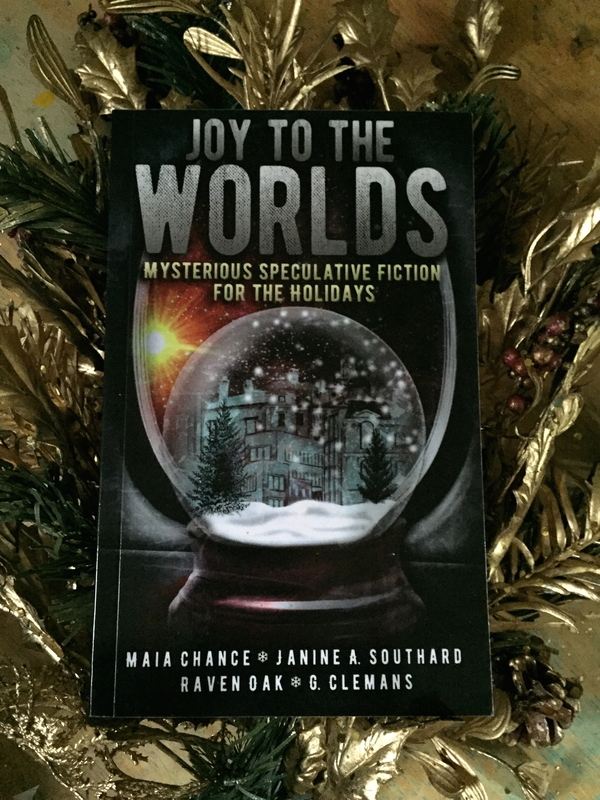 Come chat with the authors and snag a signed copy of Joy to the Worlds while you enjoy the ambiance of this unique bookstore. 12-1 PM. Further details here. DEC. 13–Kings Books in Tacoma, WA. Join us for a short reading, Q&A, and signing. 2-3 PM. Further details here. Early reviews are rolling in for Joy to the Worlds! I’m particularly excited about the one by Publishers Weekly, not only because it’s from Publishers Weekly (! ), but because, gosh, they said such nice things about my stories. “THE TWO STANDOUT STORIES”?! I’m over the moon. The full review can be read here. I could not be more excited about my upcoming fiction debut! 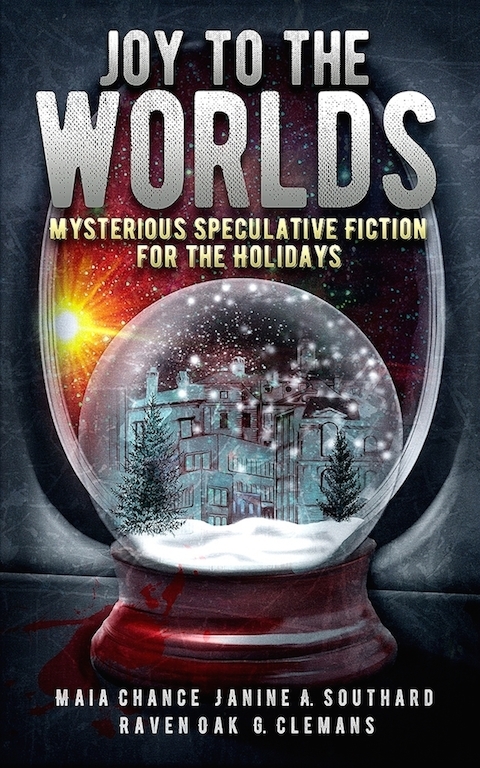 Two of my short stories are included in Joy to the Worlds, a cross-genre collection of holiday-themed short stories available Dec. 1, 2015. And I’m in great company: National bestselling mystery author Maia Chance, IPPY award-winning science fiction author Janine A Southard, and Sci Fi and fantasty bestseller Raven Oak. and other independent booksellers worldwide. 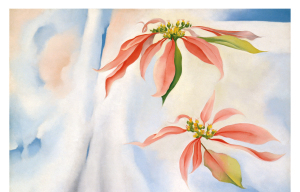 detail, Georgia O’Keeffe, “Mule’s Skull with Pink Poinsettia,” 1936. I did not come up with the title of this review. Did you know that editors at newspapers do this? Most writers do not title their own articles. I do have some issues with this artist’s work, but I’m not sure I agree with the title’s implication. 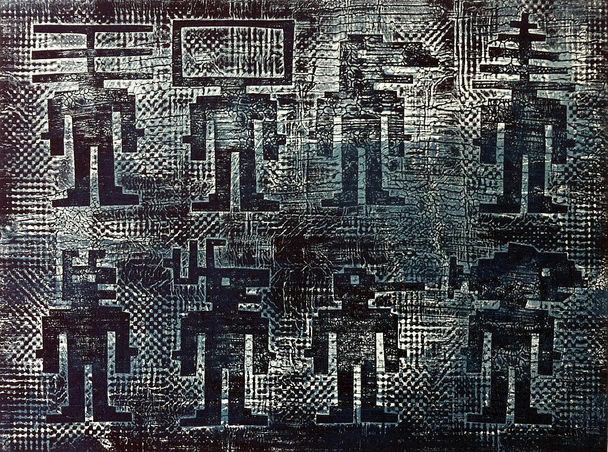 Anyway, my review of the joyful – and problematic – art by Mr. can be read here. “Ink This!” – the glorious exhibition of print arts at The Tacoma Art Museum – really left an impression on me. You can read my review (which does NOT include awful jokes, as far as I know) here.